Are you installing a new concrete paver at your home? A paver is a great way to decorate the lawn. It’s also useful for creating a level walkway between your door and your driveway. Unlike old fashioned concrete pouring techniques, laying pavers is much simpler. All you need to do is create a level surface and then piece the individual pavers together to create the walkway. It can be adjusted to just about any length and width you require. However, it’s very rare that your patio or walkway will have perfect dimensions. Perfect dimensions mean the pavers fit without needing to cut any away. Chances are, you’ll have to make some cuts and adjustments to the concrete to get everything to fit together nicely. It’s best to let a professional do this work to ensure you get a precise, high-quality job. However, this is something you can do yourself if you have the patience, confidence and the tools. You have a few different options when it comes to cutting your own concrete pavers. It depends on the tools you have available at the time. Your first option when it comes to cutting your own pavers it to use the old fashioned paver cutting technique: the hammer and chisel. This technique is extremely simple and doesn’t require any power tools. It does take time and elbow grease. You’ll also have to pay close attention and hit your marks if you want everything to fit perfectly. First and foremost, you should always be wearing safety goggles if you are cutting the pavers yourself. Using the chisel and hammer tends to send a lot of debris flying in different directions. Don’t run the risk of blinding yourself for your walkway. Use the chisel to scratch a line where you want to make your cut. You’ll then hold the chisel directly against that line. Slowly bump the chisel with your hammer. Don’t rush it. Make slow, steady, and forceful blows against the chisel. It may take two or three blows before the paver finally splits. If the paver splits with uneven edges, you can use the chisel to chip and smooth these edges. Splitters and guillotines are specialty tools designed for cutting stone and concrete blocks. Most splitters rely on hydraulic power to get the job done. Operating them is extremely simple and safe. You load the paver into the splitter at the appropriate spot. You’ll then press down on a lever that squeezes together two large, steel blades. It makes a clean and accurate cut through the paver. Hydraulic splitters make the job much easier, but there are also manual splitters. A manual splitter will require more force to operate. Splitters provide some of the best cuts, but if you’re only paving a small area, then you don’t want to shell out the money to buy your own, as they can be expensive. You can always just rent the equipment for the time needed. If you are renting the splitter, provide the rental company with enough information so they can provide you with the appropriate model of the right size. Most people who cut their own concrete pavers use a hand held saw. A Stihl saw or skill saw will both work for the job. You’ll need a work horse for the job so selecting one with adjustable sides should work best. However, the average blade won’t be enough to get the job done. You’ll need a blade with either carbide or diamond-tipped edges. This will allow it to cut through the stone or concrete. A blade meant for cutting wood will not make it through the paver and could damage the blade and possibly even the saw as well. Even with the right blade you must be careful with your cuts. It’s usually best to start with a light cut. Raise the blade and don’t penetrate the paver entirely on the first run over the mark. You then lower the blade and finish the cut on the second pass over the mark. Some people even extend it to a third cut before cutting all the way through. You can also use a table saw instead of a hand held saw. It works in much the same way and you will still need a special blade to cut through the pavers. Table saws tend to be more powerful than hand held saws. You may not need to perform multiple passes to cut the slab. This could make the process faster. Whether just for cutting or the entire installation, your best option is always hiring a professional contractor. This is true for commercial and residential projects. 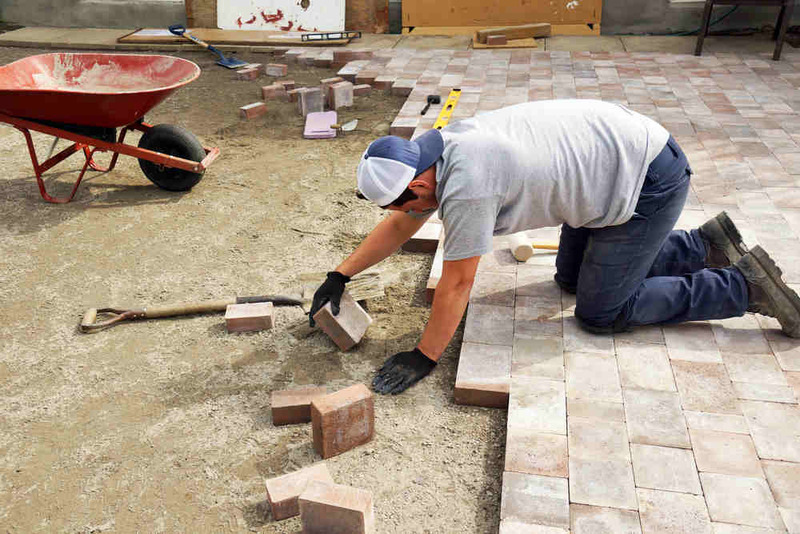 After all, most paver walkways will be seen by anyone who approaches the home or business. They are a reflection of the property itself and should look professional. Cutting concrete pavers can be dangerous, laborious, and time consuming work. Trying to handle it all yourself without access to high-grade tools only makes it worse. If you want it to look good, then it should be cut by professionals using high-grade professional equipment. This means guillotines and splitters designed for cutting concrete pavers. Fortunately, there are a lot of companies in Australia that offer professional paver cutting services.